When recording, mixing, and mastering, hearing every detail is essential -- it's what makes a mix translatable across multiple systems. Monitoring with a well-rounded pair of headphones like the Audio-Technica ATH-M50x opens up a range of sonic characteristics that are often hard to pick up on when using speakers. The ATH-M50x utilizes a closed-back, over-the-ear design, which helps bring clicks, pops and ambience to the forefront, allowing you to get the sound you need without hassle. They're excellent cans for critical listening. By using powerful neodymium magnets rather than more common ferrite magnets, the Audio-Technica ATH-M50x headphones are able to take advantage of large-aperture 45 mm drivers without adding unwanted weight or bulk. 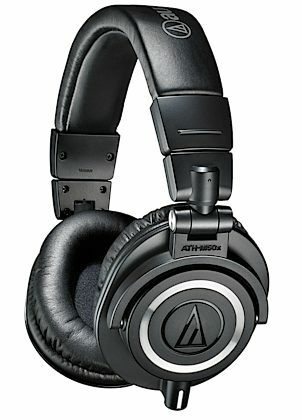 The larger drivers paired with efficient magnets offer many advantages over similarly priced headphones. For instance, exceptional power handling gives the ATH-M50x headphones their clear, extended range of 15 - 28,000 Hz, well beyond the range of human hearing. This helps make sure no subtle harmonic frequency goes unnoticed. Another advantage is a near-instant driver response, which is essential for getting accurate reproduction of drums and other instruments that have a quick attack time. Headed to a remote recording gig or session? These foldable, fully collapsible headphones fit easily in your bag. The ATH-M50x's 180-degree rotatable earcups let you monitor with both ears when you need to mix in cans, or with one ear while tracking or cueing up mixes. Since cable issues are the most common way for headphones to break, ATH-M50x headphones come with three detachable options: a 9.8' (when stretched) coiled cable, which cuts down on both potential tangles and damage to the connector when the cable is pulled too hard, a 9.8' straight cable and a shorter 3.9' straight cable. Thanks to the lightweight metal design and included carrying pouch, you can rest assured that these headphones will stand up to the wear and tear of an active musician's life. Getting the perfect sound can take time, so it's important to have headphones that will keep pace with your creative process and won't cause any strain during those long mixing sessions. The Audio-Technica ATH-M50x headphones were designed with a padded, fully adjustable headband and earcups, which cuts down on fatigue and lets you focus on your mix. Superior padding isn't only great for comfort, it also adds passive noise isolation. By cutting down on ambience from outside your signal, you'll get a truer idea of your sound. Over time, the thick padding conforms to your head, adding a greater seal and a customized fit. - Three detachable cables included: 9.8' coiled cable, 9.8' straight cable and 3.9' straight cable. As the most critically acclaimed model in the M-Series line, the Audio-Technica ATH-M50 is praised by top audio engineers and pro audio reviewers year after year. Now, the ATH-M50x professional monitor headphones feature the same coveted sonic signature, with the added feature of detachable cables. From the large aperture drivers, sound isolating earcups and robust construction, the M50x provides an unmatched experience for the most critical audio professionals. Critically acclaimed M-Series professional monitor headphones deliver accurate audio and outstanding comfort, perfect for long sessions in the studio and on the go. Contoured earcups seal tight for excellent sound isolation, with minimal bleed. And the pro-grade materials are durable, yet comfortable. Find out why online reviewers, top audio engineers, and cult followers agree, M-Series is an unmatched combination of audio and build-quality that gets the job done -- hour after hour, year after year. Sound: Straight out of the box, these things might sound a little sharp. Don't get me wrong, clarity is good! But after you bump the volume up on these babies for a week or two, they're broken in like the best pair of shoes you ever tied around your feet. You're able to hear every little hidden beat you weren't able to hear through earbuds or previously owned headphones. I disagree with being "all about that bass, no treble", but if you're listening to music on your iPod/iPhone, do your ears a favor and set your Sound EQ to "Reduced Treble". This should even it all out pretty well. But it goes to show: a little bit of fine-tuning with these will lead to the best music-listening experience you've had. My $320 pair of Beats don't even compare to the M50's. Feature: No tedious knobs or switches, just a basic aux port which is absolutely ideal for music-listening. Adjustable bands on either side of the headphones makes a comfortable fit inevitable. Ease of Use: Again, the single aux port grants serious ease of use, even with the multitude of cords and adapters that come wtih the headphones; it's all universal. Works flawlessly with Apple products, Androids phones, PC and Mac... it works with damn-near everything. Quality: So I'm sitting here, tapping on my Beats by Dre, and they sound like a hallow plastic toy you might buy for your 10 year-old nephew. Now, I'm tapping on my new Audio-Technicas and they sound like a solid piece of oak. They're mostly plastic, but they aren't cheaply made. No seems in the plastic; just a SOLID pair of headphones. Value: Why were these not upwards of $300? I mean honestly... if I had listened to these without knowing the price, I would guess them to be around $340+. It's completely backwards (which I have no reason to complain about), equal-quality Beats being around $340 and these standing around a little less than $200. Honestly, the M50's are undervalued for their given quality. I would more than likely pay over $200 for these headphones. The Wow Factor: Just.... WOW. I think I have said it all. BESTHEADPHONESEVER I've never been a fanboy of anything before, but I don't think I can say that anymore. Overall: Thinking about snagging yourself a pair of Beats, Sol Republics, or Bose headphones? Seriously, THINK AGAIN. These M50's are truly the best headphones you've never heard of. Style of Music: Hiphop, Rock, Alternative, Classic, Dubstep, R&B, and everything in between kind of guy. Written by one of our gear experts! "Incredible - Everything sounds like it has so much life & depth with these"
Overall: As a music producer & audiophile I've used different monitor speakers and headphones and listen to music mostly as WAV and AIFF files. But with these headphones I've been able to hear so many new details and be moved by songs in a way I've never experienced before. It's super inspiring. I can hear the vocals so clearly and hear exactly what's happening with echos adlibs and effects. Overtones and differences in the amounts of reverb are very distinct too. The entire tone is beautifully full from high to low end & you can feel the impact and depth of the sub bass while also hearing the all detail of the waveform and the attack and decay and everything. Hearing what's going on with the panning has never been easier either. I checked out FKA Twigs, Drake, Ariana Grande, Travi$ Scott, Famous Dex, Keith Jarrett & Charlie Haden, Baden Powell, Kanye West and much more and it's so cool hearing the articulation and such a range of tones in an instrument and hearing everything so distinctly. These are equally good for acoustic and electronic music. The price is right, the build feels totally sturdy and comfortable, noise cancelling is very effective. I also like that where the audio cable plugs into them it twists to lock so they won't accidentally get pulled out. Basically they're perfect & I couldn't be happier I bought them.